Powers: While Kwesi has no natural powers he possesses a device made by Intergang which allows him to mimic the powers of Vixen by granting him the powers of the animal kingdom. Kwesi was a man from the village in which Mari Jiwe was born. When Mari was still a child he murdered her mother which lead to her becoming an orphan and landing in America where she became the superhero Vixen. 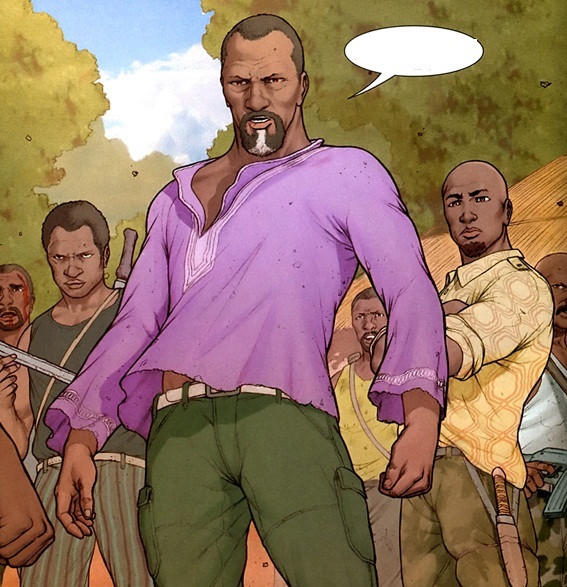 After Mari had joined the justice league she had to return to the village of her youth to face Kwesi who had allied with Intergang on some world conquering scheme. When they first met he defeated Vixen easily and left her for dead. When the league became involved he managed to control both Superman and Black Canary who could only be stopped with the aid of Vixen and Back Lightning. With his gang defeated he fought Vixen once more and this time found himself soundly defeated and stripped of his weapon and jailed. He has not been seen or heard from since. Note: When he first appeared it was hinted that he was Vixen’s biological father. ← DC Comics Planned to kill Green Lantern John Stewart! Wow, a black man punching a woman in the face. You won’t see batman or superman do that! I don’t even remember joker ever hitting Harly like that. Seems subliminal to me.